“Pacific Rim: Uprising” is a new science-fiction/action movie and a sequel to 2013’s “Pacific Rim”. While the original film was directed by Guillermo del Toro (“Hellboy”, “Pan’s Labyrinth”, and “The Shape of Water”), he only returned in the role of a producer this time around with Steven S. DeKnight helming the project. I enjoyed the first “Pacific Rim” as a self-aware film very comfortable with its clear purpose to entertain with giant robots fighting giant monsters. These combat scenes at the center this story was perfectly paced and directed with a firm sense of scale, making for an extremely fun film experience. Following some promising trailers, I was hoping that “Uprising” would provide more colossal throw downs with a fresh story to supplement the action. Like its predecessor, “Pacific Rim: Uprising” takes place during a future in which our planet has been invaded by giant ‘Kaiju’ monsters which emerge out of the Pacific Rim. Of course, they come to wreak absolute havoc on Earth and it is up to humanity to defend ourselves using giant ‘Jaeger’ suits. 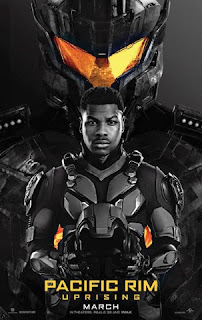 Set in 2030, this film stars John Boyega as a young man named Jake Pentecost, son of Stacker Pentecost, the legendary war hero who helped defeat the Kaiju in the ‘Battle of the Breach’ from the original movie. Ten years later, the Kaiju have re-emerged, forcing Jake to lead a younger generation of Jaeger pilots to defend our world from the destructive monsters. For an over-the-top action movie of this sort, “Uprising” certainly takes its time building up to the giant set pieces, for better or worse. While the original had fight scenes more or less sprinkled evenly throughout the run time, this movie saves a lot for the end in the form of a final act that is well constructed and absurdly entertaining. Unfortunately, there is some clunky storytelling present in the rest of the film and it simply didn’t flow as well as I had hoped. That being said, John Boyega delivered the same charisma he showed in the newer “Star Wars” episodes, proving that he has more than what it takes to be the lead man of a major action movie. Even though his storyline, leading a dystopian youth revolution, feels awfully familiar at times his relatable and humorous performance helped to compensate for clichés. All in all, I wouldn’t say that “Pacific Rim: Uprising” is the next science fiction masterpiece by any means, but it has more than enough entertainment value; especially if you are a fan of robots fighting aliens.